January 3, 2017 ~ NickyB. I almost jumped on the dining room table when I read this! 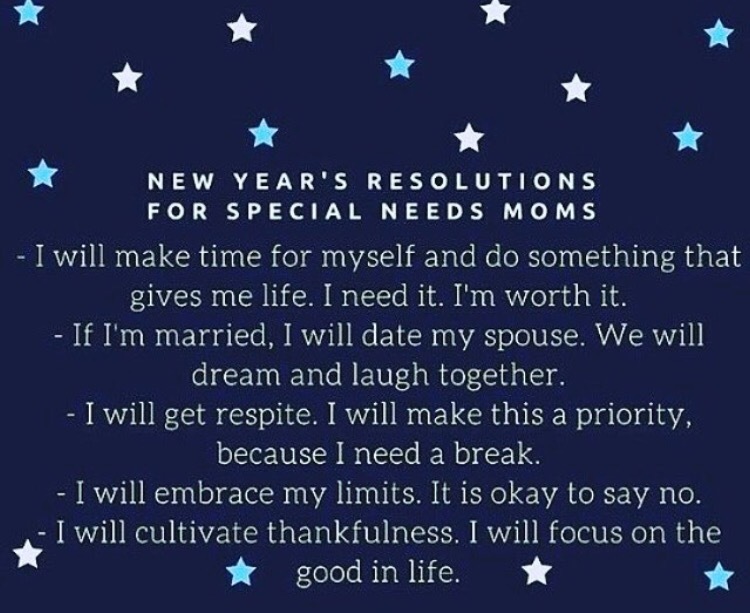 Though this says it’s for special needs moms, I believe many moms can take this as their New Year’s Goals!! I for one plan to make ALL of these a reality this year. Amen amen & AMEN! Can I get an amen?! All moms need to make this their mantra. My word for 2017 is no because I’m too busy yessing this & that. Self care is where it’s at for all moms. Bless you for posting this so other moms will not feel guilty about taking necessary time out for themselves. Amen! We always put ourselves last. Happy happy New Year dear Nicky! My wish for you is that 2017 will be even more than you can ever wish it to be 🙂 Hugs!